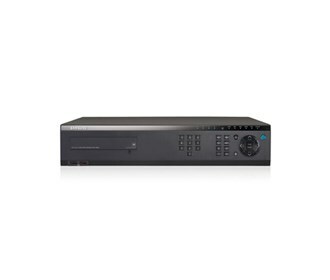 The Samsung SRD-480D is a 4-Channel H.264 DVR which is reliable Linux-based surveillance solution for users looking to match economy with professional performance. This DVR supports recording of HD/Full HD resolution images from HD-SDI cameras. Real-time recording images across all channels at 720p HD resolution, the SRD-480D enables the user the opportunity to record in resolutions of 1080p Full HD over selected channels. The HD-SDI system provides a set of benefits over conventional analogue/network systems. It utilizes existing analogue infrastructure of coaxial cable while providing much higher resolution of image quality. H.264 compression technology allows you to save on storage space while also minimizing the bandwidth requirement for operations. It transmits uncompressed, unencrypted digital video signals and result in clear crisp images without any loss or delay. Adding to your convenience are features such as 2 USB ports for backup, email notification of user-defined critical events, and RS485 for PTZ controls. The Samsung SRD-480D-1TB has many exciting features for users of all types. See the Samsung SRD-480D-1TB gallery images above for more product views. The Samsung SRD-480D-1TB is sold as a Brand New Unopened Item.